Former super middleweight titlist Lucian Bute will end a 19-month layoff when he returns to the ring to face unheralded Italian fighter Andrea Di Luisa in a scheduled 10-round bout Aug. 15, promoters Yvon Michel and InterBox's Jean Bedard announced Tuesday. The bout, to be contested at a catchweight of 171 pounds as Bute determines whether he wants to remain at light heavyweight or return to super middleweight, will be the main event of a Premier Boxing Champions card (NBC Sports Network, 9 p.m. ET) at the Bell Centre in Montreal, Bute's adopted hometown, where he enjoys immense popularity. Bute has not boxed since January 2014, when he lost a clear 12-round unanimous decision to former light heavyweight champion Jean Pascal, also of Montreal, in what many heralded as the biggest fight in Quebec history. Bute (31-2, 24 KOs), 35, a southpaw, was due to return from the loss in December but suffered a back injury during training that sidelined him. "I'm ready and looking forward to going back in the ring," Bute said. "I have not lost my passion and I train six days a week, twice a day. I am excited to perform on the big stage on Aug. 15." Bute had been training with Hall of Famer Freddie Roach at the time of his injury, but they have parted ways, mainly because of Roach's busy schedule and Bute's desire to train in Montreal. His trainer for next month's fight will be Howard Grant. "Bute arrived at the gym three month ago," Grant said. "We have corrected a lot of mistakes, like keeping his hands high and to be more efficient inside. I can't believe he has been champion for so long making so many mistakes, but I am a mechanic and I will fix it." Bute claimed a 168-pound world title in 2007 and made nine successful defenses, eight in Quebec and one in his birth country of Romania. But when he left the comforts of home and traveled to Nottingham, England, to face Carl Froch in Froch's hometown in May 2012, Froch crushed him in five one-sided rounds to take his title. Bute has fought just twice since -- a 12-round decision victory in a huge struggle against Denis Grachev in what was supposed to be a layup in November 2012, followed by the one-sided loss to Pascal. 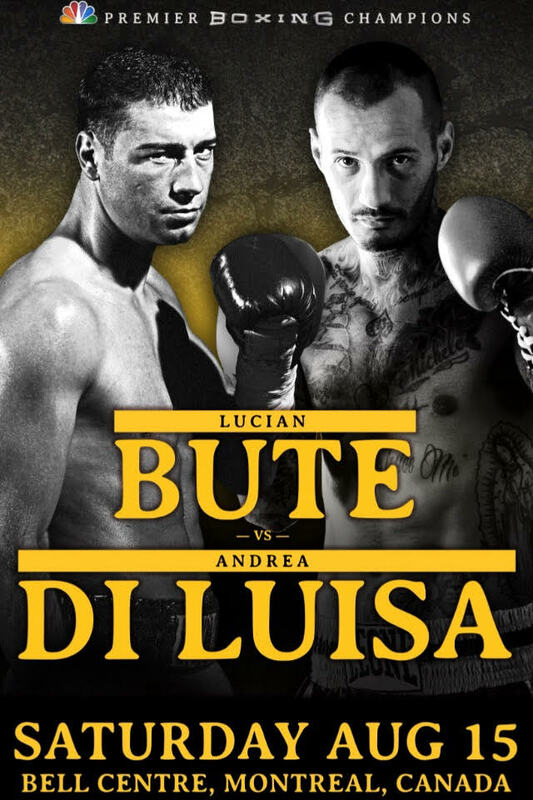 Di Luisa (17-2, 13 KOs), 33, of Italy, who has won four fights in a row against low-level opposition, will be fighting outside his home country for the first time and facing a name opponent for the first time. "I'm very happy about this opportunity," Di Luisa said. "I know Bute because I fought him in the amateurs. He is very good and I respect him, but I don't fear him." In the co-feature, light heavyweight Eleider Alvarez (17-0, 10 KOs), a 2008 Colombian Olympian, will take on Isidro Ranoni Prieto (24-0-3, 20 KOs) of Paraguay in a scheduled 12-round bout. In another fight on the show, heavyweight Oscar Rivas (17-0, 12 KOs), also a 2008 Colombian Olympian, will face an opponent to be determined.